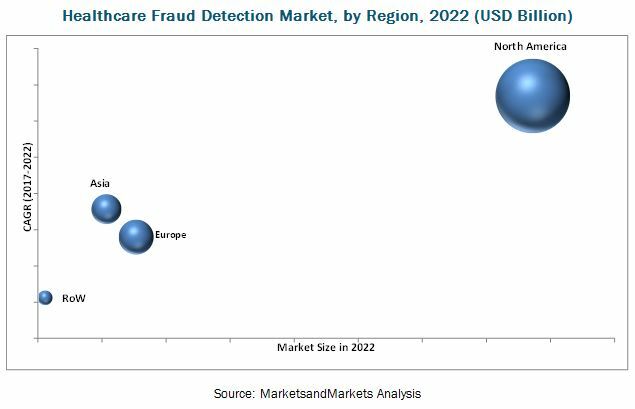 [160 Pages Report] The overall healthcare fraud detection market is expected to grow from 2,242.7 million by 2022 from USD 504.4 million in 2016, at a CAGR of 28.9% from 2017 to 2022.Some of the major factors like large number of fraudulent activities in healthcare; increasing number of patients seeking health insurance; the prepayment review model; growing pressure of fraud, waste, and abuse on healthcare spending; and high returns on investment will help in the growth of the market. The healthcare fraud detection market is expanding with the emergence of new applications and technologies. Healthcare fraud detection solutions are being used in applications such as insurance claims review, including post-payment review and pre-payment review, payment integrity and other applications including case management and identity management. The base year considered for the study is 2016 and the forecast period is from 2017 to 2022. Fraudulent healthcare claims increase the burden on the healthcare system of the society. As healthcare costs rise, the costs associated with these schemes also rises, thus making the consumers endure rising insurance premiums and out-of-pocket expenses. 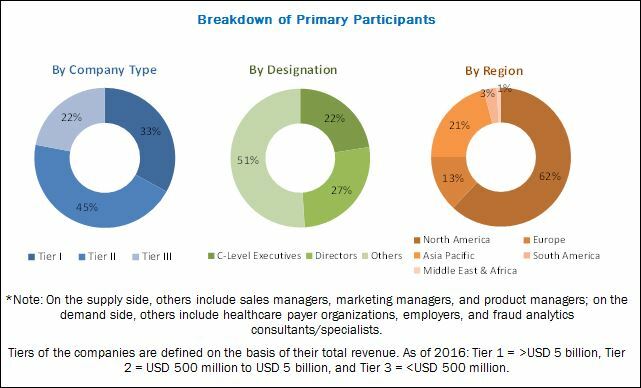 During this research study, major players operating in the healthcare fraud detection market in various regions have been identified, and their offerings, regional presence, and distribution channels have been analyzed through in-depth discussions. Top-down and bottom-up approaches have been used to determine the overall market size. Sizes of the other individual markets have been estimated using the percentage splits obtained through secondary sources such as Hoovers, Bloomberg BusinessWeek, and Factiva, along with primary respondents. The entire procedure includes the study of the annual and financial reports of the top market players and extensive interviews with industry experts such as CEOs, VPs, directors, and marketing executives for key insights (both qualitative and quantitative) pertaining to the market. The figure below shows the breakdown of the primaries on the basis of the company type, designation, and region considered during the research study. The healthcare fraud detection market is highly competitive with the presence of various players. Some of the major players operating in the market include IBM (US), Optum (US), SAS (US), McKesson (US), SCIO (US), Verscend (US), Wipro (India), Conduent (US), HCL (India), CGI (Canada), DXC (US), Northrop Grumman (US), LexisNexis (US), and Pondera (US). In 2017, DXC Technology (CSC) entered into a collaboration with Virtual Clarity (UK) to offer clients’ next-generation IT solutions for their cloud environments. In 2016, IBM acquired Truven Health Analytics provider of cloud-based healthcare data, analytics, and insights. This acquisition strengthened IBM’s product portfolio for fraud, waste, and abuse detection and customer base. In 2017, LexisNexis entered into a partnership with National Insurance Crime Bureau (NICB) as per which NICB added LexisNexis’ Risk Solutions to the NICB Strategic Partner network of companies to identify and fight insurance fraud. .
What are new application areas which the healthcare fraud detection companies are exploring? The healthcare fraud detection market is expected to reach USD 2,242.7 million by 2022 from USD 631.0 million in 2017, at a CAGR of 28.9%. Market growth can be attributed to the large number of fraudulent activities in healthcare; increasing number of patients seeking health insurance; the prepayment review model; growing pressure of fraud, waste, and abuse on healthcare spending; and high returns on investment. Healthcare fraud is intentional deception or misrepresentation of facts by patients or healthcare providers that can result in unauthorized benefit or payment. Examples of fraud may include submitting claims for services not provided, falsifying claims or medical records and misrepresenting dates, frequency, duration or description of services rendered. Fraud detection is the efficient use of data analytics and related business insights developed through statistical, quantitative, predictive, comparative, cognitive, and other emerging applied analytical models, for detecting and preventing healthcare fraud. Descriptive analytics, predictive analytics and prescriptive, are some of the fraud detection analytical tools that are used for detecting healthcare frauds. The healthcare fraud detection market has been segmented, on the basis of component, into services and software. The services segment is expected to register highest growth rate over the forecast period. With the increasing need for fraud analytics services and the introduction of technologically advanced healthcare fraud detection software, which requires extensive training to use as well as regular upgrades, the services segment is expected to grow at the highest CAGR during the forecast period. The healthcare fraud detection market in North America is expected to grow at the highest CAGR during the forecast period. Factors such as increase in the number of people seeking health insurance, increasing cases of healthcare fraud, favorable government initiatives to combat healthcare fraud, rising pressure to reduce healthcare costs, technological advancements, and greater product and service availability in this region are expected to drive market growth in North America. Insurance claims reviews is one of those applications where healthcare fraud detection solutions are extensively. The number of people seeking health insurance globally has increased significantly in the recent years. This, in turn, is resulting in a growing burden on healthcare payer organizations to process large volumes of claims data with a higher probability of fraudulent claims. Hence, health insurance claims review is one of the major applications of healthcare fraud detection solutions. Healthcare payment integrity (PI) refers to the correct payment of each claim (the payment made by an appropriate party to another appropriate party) for the treatment of an eligible individual according to the plan-of-benefits contract. The payment must be neither in error nor in duplicate, and it must be absent of wasteful or abusive practices. Payment integrity is not limited to claims adjustment and is determined by an end-to-end business process beginning with the defining plan of benefits and enrollment of members, right through to claims processing, payment, and customer service. This segment includes identity management and case management. Healthcare reforms and heightened regulatory scrutiny have made identity management a top priority within healthcare organizations and across health information and insurance exchanges. As a result of the growing number of new consumers entering the healthcare system and more medical transactions being conducted online, access to a scalable information management infrastructure that can link health information to individuals as well as identify and authenticate users accessing this protected data is gaining increasing importance. What are the upcoming industry applications for healthcare fraud detection? Reluctance to adopt healthcare fraud detection analytics in emerging countries is a major factor restraining the growth of the market. The continued use of existing basic analytics tools is restricting the implementation of newer solutions among end users in emerging countries. Many payers in these countries continue to rely on manual methods of basic business analytics tools. These tools are used at the departmental-level and are capable of using only retrospective data. Reports are seen as “good enough for now” until they become too inefficient to continue. Since such regions lack established processes to capture data, analyzing unstructured data is also a challenge. Moreover, many healthcare payer organizations in these countries are reluctant to adopt advanced fraud analytics solutions due to budgetary constraints and lack of operating skills. This reluctance to change existing systems is one of the major challenges for healthcare analytics vendors operating in emerging markets. Also, in some emerging economies, the adoption rate of healthcare analytics solutions is low due to lack of language support in solutions. Key players in the market include IBM (US), Optum (US), SAS (US), McKesson (US), SCIO (US), Verscend (US), Wipro (India), Conduent (US), HCL (India), CGI (Canada), DXC (US), Northrop Grumman (US), LexisNexis (US), and Pondera (US). These players are increasingly undertaking agreements, partnership, collaborations and contracts, expansions and acquisitions, and product launches to develop and introduce new technologies and products in the market.